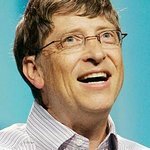 In philanthropist Bill Gates' 2014 annual letter for the Bill and Melinda Gates Foundation, he debunks three myths that he sees are hindering progress towards ending world poverty. Myth number one, he says, is that poor countries are doomed to stay poor. Gates says that over the past 50 years, there has been an enormous shift of developing countries into what he calls ‘middle income’ countries. Myth number two he challenges is that foreign aid is a waste of money and keeps countries dependent on aid. This is a particularly dangerous thought because political leaders use it as an excuse to cut aid. Myth number three, that saving lives leads to overpopulation, is actually the opposite of what happens. Gates predicts that there will be almost no poor countries left in the world by 2035. “If you read the news every day,” he says, “it’s easy to get the impression that the world is getting worse.” He thinks it’s getting better.